Please check out Newest Released 2-wire Transmitters with Standard, FM & Hart Models Available TXUN Series for more advanced features with better price. The TX86 is a 2-wire Loop-Powered, Galvanic-Isolated, Programmable Universal Input Temperature Transmitter that is designed to be head-mounted, but can be standalone as well. It uses 16 bits A/D and D/A converters offering high accuracy with Linearized 4 to 20 mA or 20 to 4 mA outputs. Being a user-friendly rugged instrument, it displays the measured variable and has a SSR output. 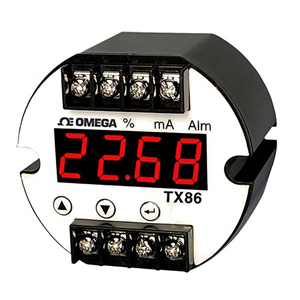 The TX86 has 3 push buttons on its front keyboard & a 4-digit 7-segment bright LED display module that indicates the values of the measured parameters during the Measuring Mode while also providing prompting and programming instructions during the setup and calibration mode routines. The 1000V AC galvanic isolation removes all ground loop effects. Three different engineering units (°C, °F and %), can be displayed and the chosen unit is highlighted by an associated LED lamp when in the measuring mode.